The bank increased its estimate by 67% of potentially unauthorized customer accounts opened since 2009. The first step in addressing a problem is recognizing that there is one. 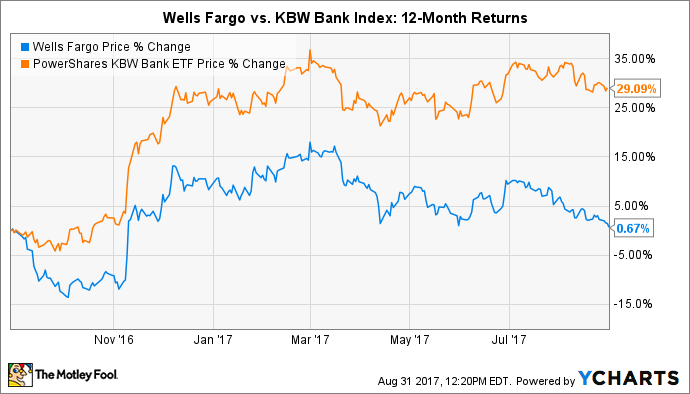 That's a lesson Wells Fargo (NYSE:WFC) seems to have taken to heart. The Wells Fargo stagecoach has seen better days. Image source: Getty Images. The updated figure marks a meaningful increase over the bank's previous estimate of as many as 2.1 million unauthorized accounts. But that estimate was confined to a narrower time frame, from May 2011 through mid-2015. By extending the analysis back by two-and-a-half years, Wells Fargo uncovered an additional 981,000 accounts identified as potentially unauthorized. It's by adding the two figures together, in turn, that the California-based bank came up with its 3.5 million estimate of the extent of its fake-account scandal, which had been revealed by the Consumer Financial Protection Bureau in September of last year. "We apologize to everyone who was harmed by unacceptable sales practices that occurred in our retail bank," said Wells Fargo CEO Tim Sloan. "To rebuild trust and to build a better Wells Fargo, our first priority is to make things right for our customers, and the completion of this expanded third-party analysis is an important milestone. Through this expanded review, as well as the class action settlement, free mediation services, and ongoing outreach and complaint resolution, we've cast a wide net to reach customers and address their remaining concerns." The analysis identified, as potentially unauthorized, accounts with only one minimal payment and no further use of the service. Some customers may have made an authorized introductory payment and then elected not to use the service. Therefore, the analysis did not definitively identify whether an enrollment was authorized by a customer or not, and properly authorized enrollments are likely part of this total. Wells Fargo's fake-account scandal has done considerable damage to the bank's reputation. It has also weighed heavily on the bank's stock, curtailing gains that the rest of the industry have benefited from over the past 10 months. Yet, as time goes on, and as Wells Fargo continues to identify and remedy the root causes of its sales scandal, it's fair to presume that its stock will eventually emerge out from under the dark cloud that's currently settled over the bank. Helping out in this regard is the bank's biggest shareholder, Warren Buffett. In an interview with CNBC earlier in the week, the 87-year-old billionaire chairman and CEO of Berkshire Hathaway said that all of the bad news hasn't changed his opinion that Wells Fargo is a "terrific bank" and a solid long-term investment.